Product Config : Product Configuration for the release. If it does not exist it will be created. Although this parameter is not required, it is a good idea to include it if you are specifying a Release Name. Release Name : The Release Name as specified in the Release Wizard (in the InstallShield IDE) You can use an existing release name or create a new one. Although this option is not required, it is a good idea to include it if you are specifying the flag for product configurations. Release Config : This option allows to specify whether you would like to have your release compressed into one file or remain uncompressed in multiple files. This is optional, if the release name already exists, the configuration will be based on what is specified in the InstallShield IDE. If this is ignored for a new release, the new package will be uncompressed. Release Flags : Use this option to specify any Release Flags that you would like to include in your build. Separate multiple flags with a comma. Output Directory : Qualified path to where you want the output folders to be placed. 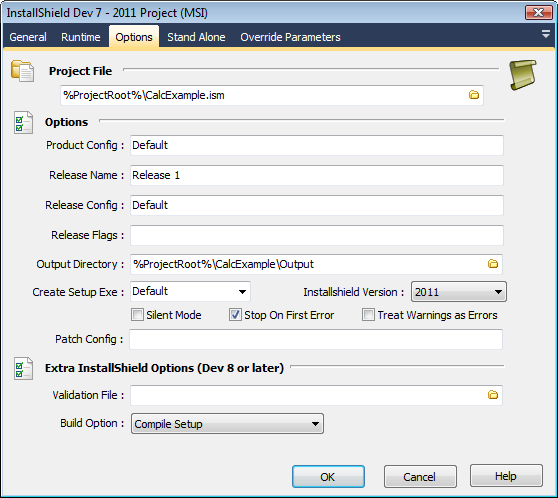 This is optional, if not specified then the build will place the build package and files in the directory specified in the Project Location section of the Options panel in InstallShield. Create Setup.Exe : Specify whether or not you would like to create a setup.exe along with your setup project. InstallShield Version: Use this option to specify which version of InstallShield you are using. Stop On First Error: Build will stop if an error is encountered. Silent Mode : Run the InstallShield compiler in silent mode, this will disable the output of compiler messages. Treat Warnings as Errors: Any warnings issued by the Installshield compiler will be treated as errors. Stop on First Error : By default, the Installshield compiler does not stop when it encounters an error, it just keeps a count of errors to report at the end. Enable this option to stop the build as soon as the compiler encounters any error. Patch Config: This option allows you to specify the name of the patch configuration that you wish to build. Validation File: Specify a CUB file (.cub) to validate the installer package once it is built. • Tables Only - Builds only the Windows Installer Tables for your release. • Tables and Refresh - Builds Windows Installer Tables and refreshes files. 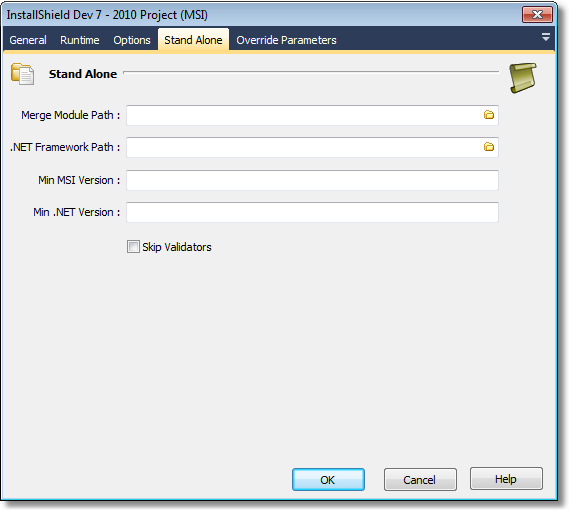 Merge Module Path : Enter a single path or multiple comma separated paths to the merge modules. You will need to manually quote this field if you are entering multiple paths (individually quoted) or your path contains spaces. The first path is what is selected as the path to copy the MSM file.